If you ask anyone that knows what a browser is and what Free Software is, what is the most used Free Software Browser, [almost] everyone will answer "Firefox!". But it is not, sorry to be a bubble buster to all that people that thought Free Software was having a nice champion on Firefox. This source code is subject to the U.S. Export Administration Regulations and other U.S. law, and may not be exported or re-exported to certain countries (currently Afghanistan (Taliban controlled areas), Cuba, Iran, Iraq, Libya, North Korea, Sudan and Syria) or to persons or entities prohibited from receiving U.S. exports (including Denied Parties, entities on the Bureau of Export Administration Entity List, and Specially Designated Nationals). And everyone knows Free Software and Open Source definitions are completely AGAINST limiting who can use the software. So probably most used Free Software Browser is Konqueror. Update: Ok, i'm completely stupid and idiot, and wrong, because seems everyone accepts removing freedoms because someGoverment says it, does not make your program unfree, i completely disagree, but obviosuly i'm not a lawyer and as said i'm stupid and idiot so my opinion is worth zero. BTW this never wanted to be an attack to Firefox or to anyoneelse, just a curious thing i discovered. Anyways i thought one could post random thoughts on his blog, but now it seems planet.kde.org is an official kde channel instead of what it says it is "Planet KDE is an aggregation of public weblogs written by contributors to the K Desktop Environment. The opinions expressed in these weblogs and hence this aggregation are those of the original authors. Planet KDE is not a product or publication of KDE e.V. ; as such, it does not necessarily represent the views of the KDE project as a whole or the views of KDE e.V." 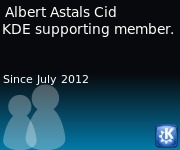 So do not associate this idiot blog with KDE or KPDF or Poppler or other projects i contribute to, the only idiot here it's me, Albert Astals Cid. Update 2: So it seems that restriction is not transitive, that is, one can download firefox from US to Spain and then one can download it from Spain to Cuba, isn't law something strange? /me is glad he has not anything to do with law in his life. Sometimes i have that strange feeling that people are trying to make fun of me. Just know i've had this feeling again, i've tried to go to a webpage of local radio that also uses internet for the broadcast so i could hear FC Barcelona vs AC Milan soccer match. The interesting thing is that you can not make it work under linux because they're using a Flash 8 animation to load the audio player! Translating the release announcements to different languages is important because that makes it easier for non-english speaking people and media to spread the good news that a new KDE version is out.